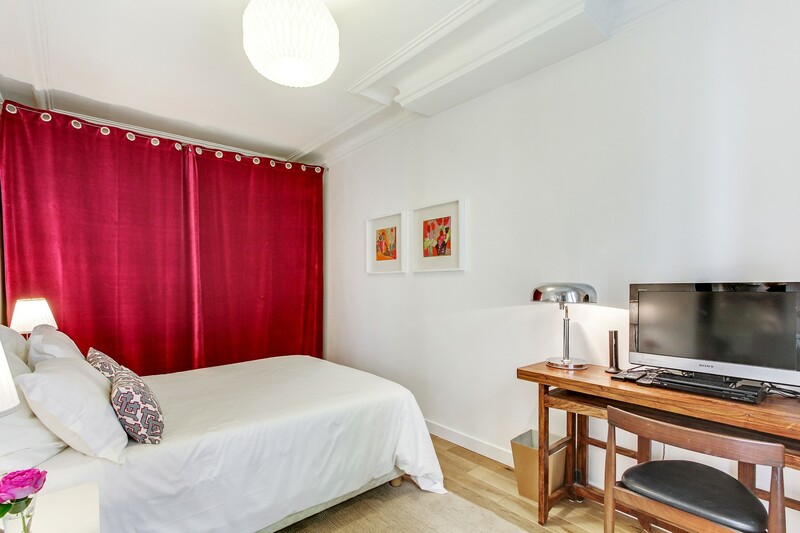 The apartment is in the trendy village atmosphere of Montmartre: just a few minutes walk to the Sacre Coeur with its spectacular views of Paris, where 'Amelie' was filmed. 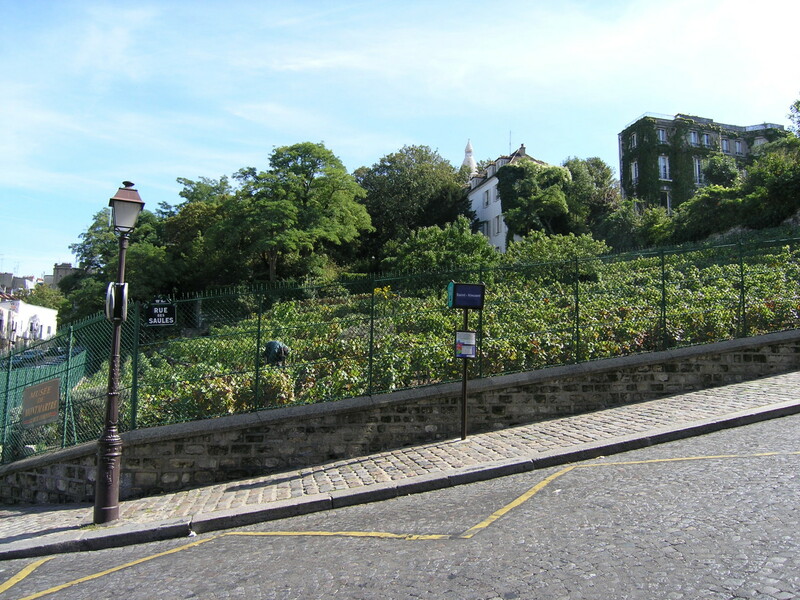 Close to museums, theaters, and the tiny vineyards of Montmartre (the only ones left in Paris). There are great French delis, an outdoor market open six days a week, as well as charming restaurants and cafes. Discretely tucked away from the main street, this well-balanced, calm and spacious apartment measures 36M2 or 400 square foot. 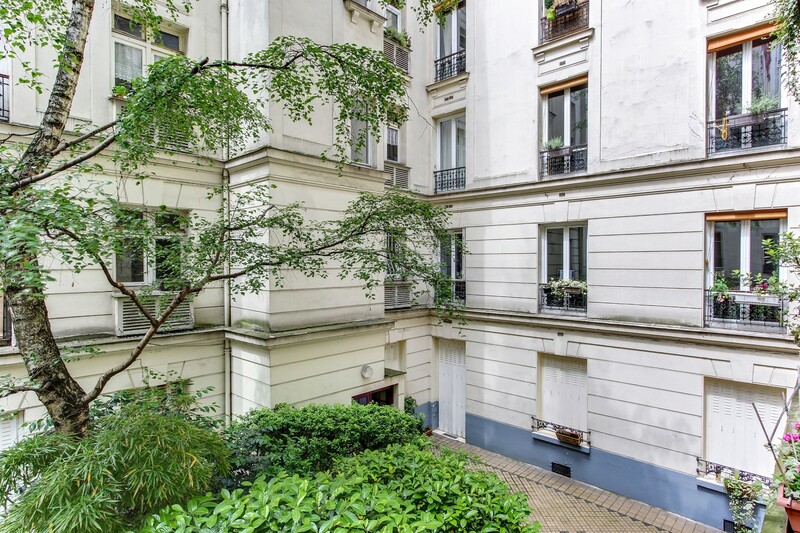 It has an open plan see through arrangement from the entrance hall all the way to the end of apartment and all main rooms have tall French windows with hanging potted plants overlooking an open garden courtyard. The ivory walls are hung with vibrant paintings and the flooring is antique oak wood. The small, practical and fully-equipped kitchen which opens out to the living room and dining area has everything you need to cook and eat with, however enticing the many local restaurants in the area! The comfortable living room with modern furnishings has ambient lamps and a stereo CD player with a selection of CD's. The extra long sofa (2 metres by 90 cm) can also be used as a single bed. In the corner is the dining area with table and chairs for four, overlooking the silver birch tree in the courtyard. If you want a change of view you can also watch cable TV and films on the DVD player from the dining table and there is a selection of DVD's for your use. 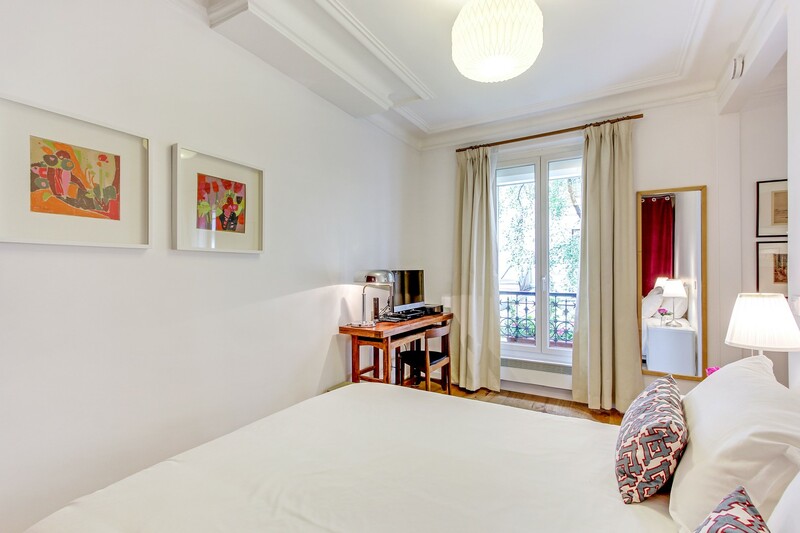 The bedroom has a double bed, a large closet, tasteful paintings, a desk and French window. The bathroom is modern with bath, powerful wall shower (in bath), basin and toilet. Towels and French soap are provided. There is a telephone with freee international calls available (you can call the Australia and most of Europe free limited to landlines and to North American landlines and cell phones). Set in a quiet cobble-stone street it's a minute away from the metro station Lamarck-Caulaincourt (line 12), and bus No: 80 taking you to the Grands Magasins (Galleries Lafayette, Printemps) and the Champs Elysees - you can also hop on to the Montmartrobus which takes you around the best sites in Montmartre. In the immediate area there is a wonderful selection of little grocery shops, butchers, boulangeries, delis, fruit and vegetable shops, charcuteries, newsagents and supermarkets as well as lots of lovely restaurtants and cafes. We very much liked the local area which made you feel more like a Parisian than a tourist. The local Montmartre bus was very good and avoided lots of walking but gave you a good understanding of what was available in the area. The apartment had all you would want, was comfortable, well furnished and clean. My husband and I greatly enjoyed our stay here. It was the perfect location for a week in Paris - close to the Metro for getting to all the main sights, but on a beautiful quiet street in Montmartre, my favorite neighborhood in Paris. There is so much close by - so many cute cafes and restaurants. The home itself is warm and inviting, with plenty of space. We would love to stay here again the next time we come to Paris. Highly recommend. This apartment was really delightful. It was very cute and has a nice design. 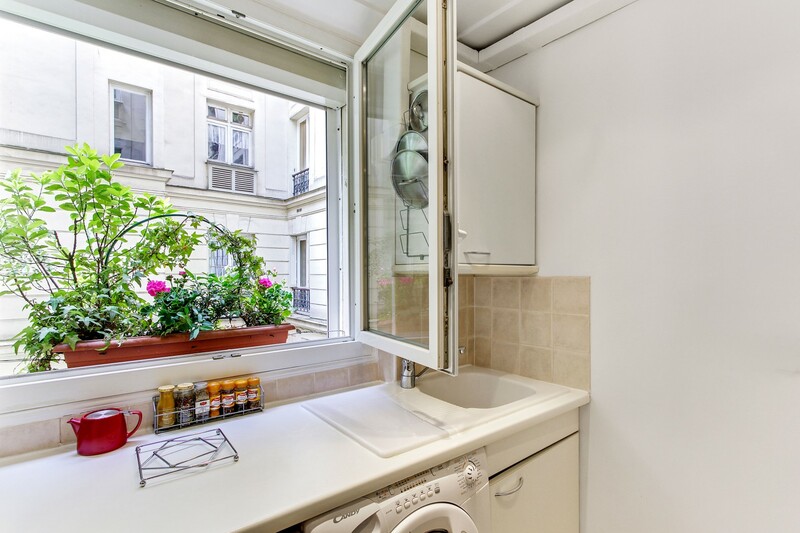 The space is average size for a rental in Paris, but still lots of space to move around. Lots of storage space in the bedroom. The kitchen had lots of amenities. Even a salad spinner. The stove is excellent and modern, as well as the dishwasher. Everything works well, and the water pressure is amazing. It might be a little on the cozy side for 4 people, but you could manage. For 2 people, it was perfect. The bed is comfortable, and there are true black-out shutters, which helped for an amazing sleep. Good internet connection, which does need to be reset occasionally (it's explained, and very simple to do). The apartment is secure with a good lock, and the building and neighbourhood are safe and quiet. The immediate area is absolutely beautiful, and has a great fresh fruit/vegetable store, convenience stores, a delicious bakery, hardware store and a cheese shop within a one-minute walk. Several excellent grocery stores are very close by. I always find all Parisians to be extremely polite, open and friendly; the people in this neighbourhood were especially warm and genuine. The Metro is 2 minutes away. If you arrive by Metro, be aware that the station has a regular elevator/lift to make it easy, (otherwise there are many stairs if you have luggage). As many have mentioned, some of the area has lots of steps and hills, so be aware that this area would not be so easy for some people. However, there is a lot of the area which does not have steep hills, so some parts are not so difficult. Getting to the Metro does involve climbing steps, and there are about 40 steps in one direction outside the building (but not in the other direction). It was a great stay, and the host was very friendly and communicative by email. Everything worked properly, and the surrounding area (and, of course, the rest of Paris) was absolutely beautiful. 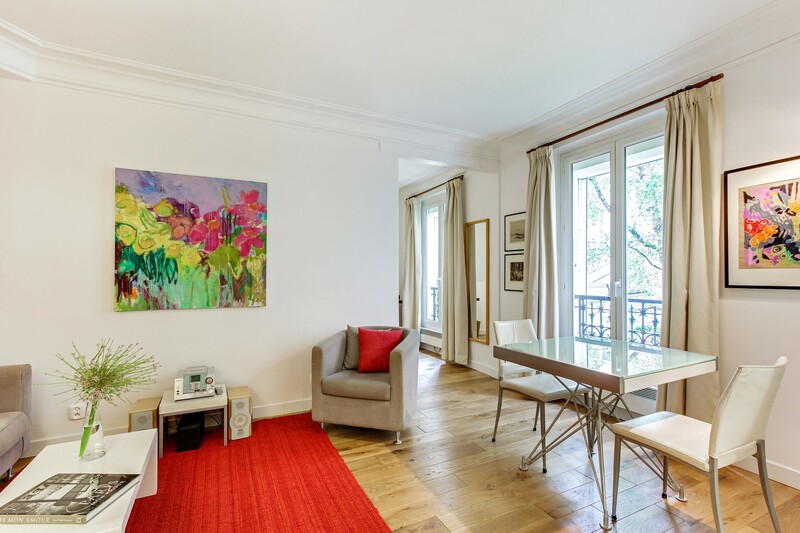 My husband and I stayed for eight days in the Montmartre Vineyards apartment. We found it exactly as was described and everything we could possibly need for our vacation. It was very clean and everything listed was in working order. The apartment was quiet, the bed was very comfortable and had the best WIFI! The bedroom had plenty of closet space and drawers for our clothing. Location was great and having the Metro Line #12 a block away made it easy to visit other parts of Paris. The trip was to visit our daughter who lives in Paris over 13 years. We have previously rented numerous apartments while visiting, but this was by far the best apartment and rental experience. The initial reservation process was easy and communications with rental agency was always done on a timely manner. Prior to our arrival, we were given explicit instructions on entrance to the apartment and where we would meet the agent. The agent was waiting in the apartment when we arrived and answered all our questions and thoroughly explained how everything worked. There is a binder full of instructions, helpful hints and telephone numbers that one might need during their stay. The building the apartment is located in was also very clean and neighbors were quiet and friendly! 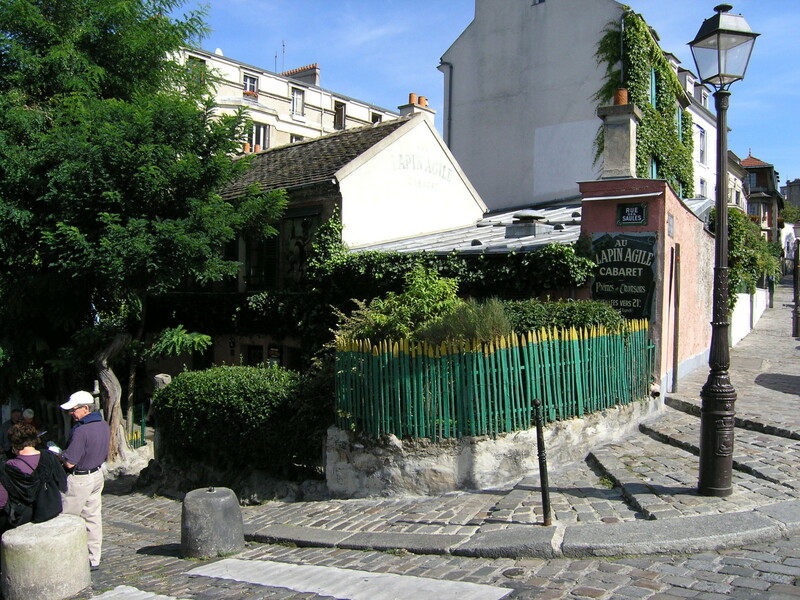 The Montmartre area has many restaurants, cafes and bistros. I suggest visiting some of the "non-tourist' places to eat and enjoy where the Parisian's eat. 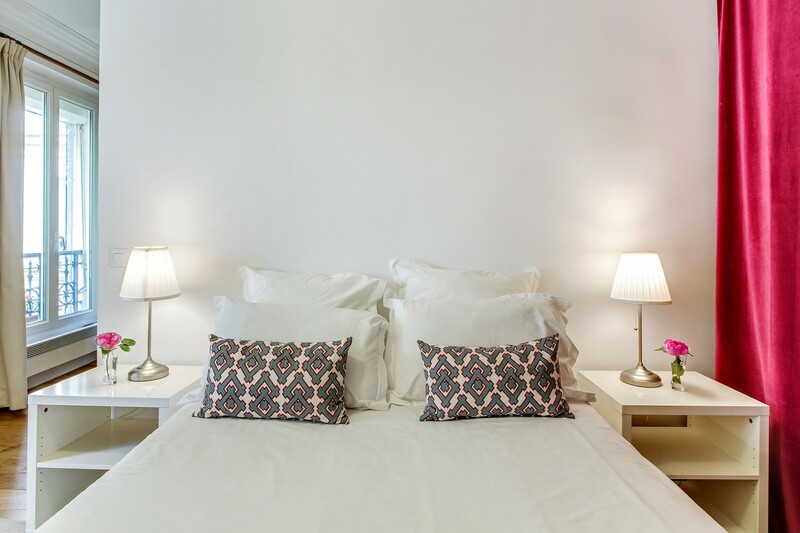 We have no hesitation recommending the apartment to friends and family and would love to visit and stay again in the future.
" Safe and comfortable romantic get away"
What an exquisite little jewel near all of montmartes treasures? we enjoyed it very much. We enjoyed the location in Montmartre very much! We stayed for 10 day's. The Metro is very close and was easy to use, we used it a lot of the time when visiting different sites and shopping. The apartment is as indicated which is everything we wanted, ie kitchen, washing machine, WiFi, and the bathroom is even a decent size (and actually the bed was super comfy as well). We also were given a special gift for our anniversary, which was very thoughtful and appreciated! Very good people to work with all around, regarding information gathering, the booking of the apartment, checking in etc! 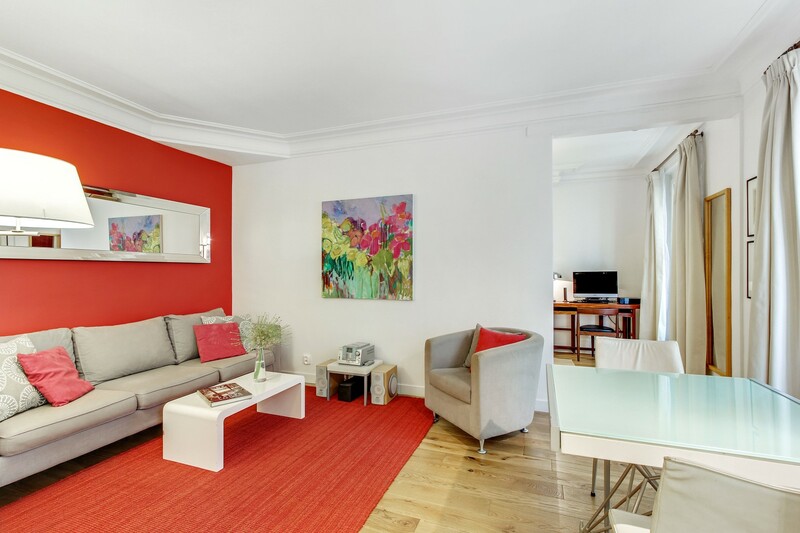 We felt the apartment was good value for Paris, and we were very happy we booked here!! 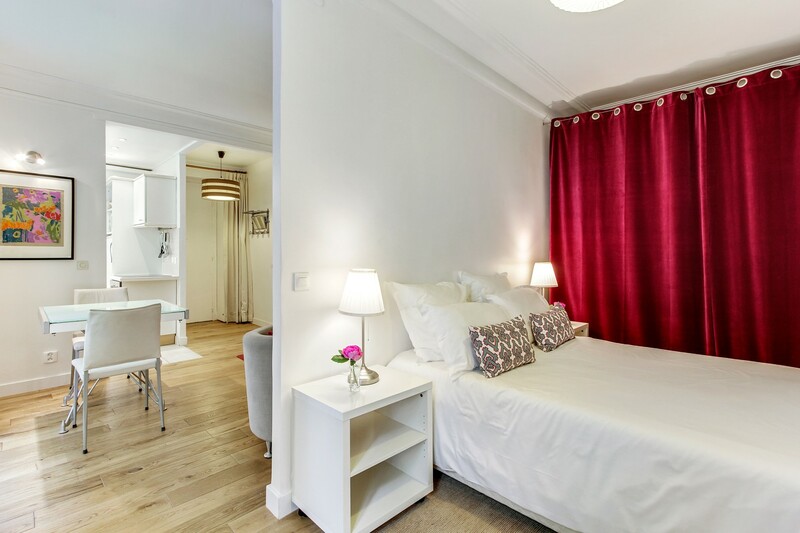 We would definitely recommend this apartment, and hopefully we will also be back soon! We loved Paris!! it was everything and more than we expected!!! and we think having a good place, (and operated by good people! ), to stay is a big part of having such a good experience!! thanks again!! "Very good address in the 18th"
This is the third time I have stayed in this sweet apartment. It had everything I needed. It's on an inner courtyard so it is peaceful and yet steps away from the best cheese, bakers, greens, butcher....I will always stay here when I'm in Paris. I like the location. It's easy to get from the airport to here. You can tell the owner stays here in the off season for the kitchen is well set up. The only suggestion I have for them to imporve the place is a small safe in the closet would be nice. And yes I will be retuning. From the minute we arrived we loved this apartment. Shelley (staff) welcomed us on arrival and spend some time explaining everything. 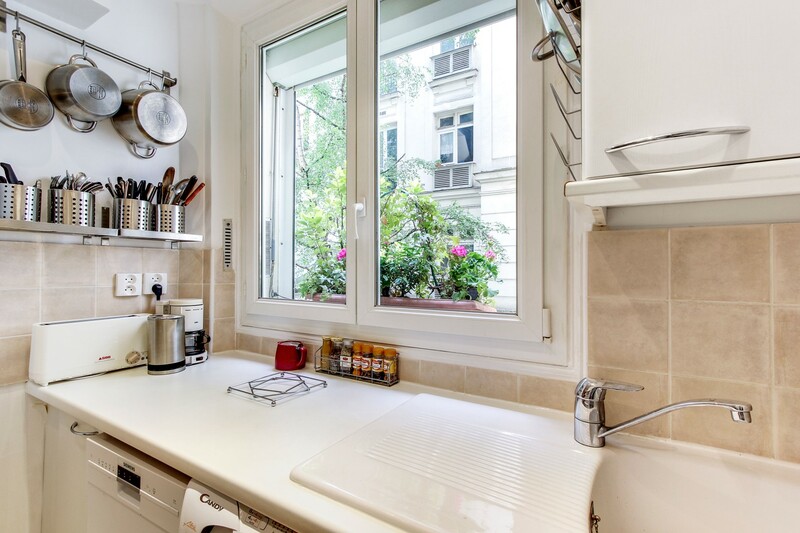 it is a few blocks away from the Sacre Coeur with easy access to the metro, buses, grocery stores, bakery, the post office and everything you need to make you feel at home. The apartment is fully equipped and perfect for 3 people! The WIFI is fantastic and although we did not use the PC it was available. Everything was exactly as on the website down to the finest details. I recommend it to anyone except people with disabilities as the metro and shops all have stairs and steep climbs. We will definitely be back!!!! We decided to spend our 30th anniversary in Paris, and we returned to the Vineyards. We had visited there in 2012, and it was great ... again. This is a quiet suite, facing on a courtyard. TV, computer (we didn't have to bring our own), wi-fi, full kitchen, international phone, make this a perfect place to stay, especially for the price. Staying at Montmartre Vineyards was a real joy! The apt. is conveniently located to the Metro, any type of store needed, as well as relaxing restaurants offering delicious food and good service. The neighborhood is very safe and we walked everywhere. Since we were there for 8 nights, the washer/dryer was an added value, and all appliances worked well. The courtyard is beautiful and the property is extremely clean and well maintained. After a day of sightseeing, the comfortable bed and quiet atmosphere was appreciated. The apt. had everything we needed with plenty of space for the three of us. Our agent, Shelley, was extremely personable upon our arrival and easily answered our questions. Prior to departure, Elodi handled all the booking arrangements professionally and gave great advice about transportation upon arrival to Paris. This is our second booking with this broker and we highly recommend them! We were so comfortable at Montmartre Vineyards. Michele and Elodie were so friendly made the whole experience a pleasure. The apartment was in a quiet neighborhood, yet close to restaurants, food markets, and wonderful quaint shops. I hope to return for a longer visit, and would be happy staying at Montmartre Vineyard, again.
" 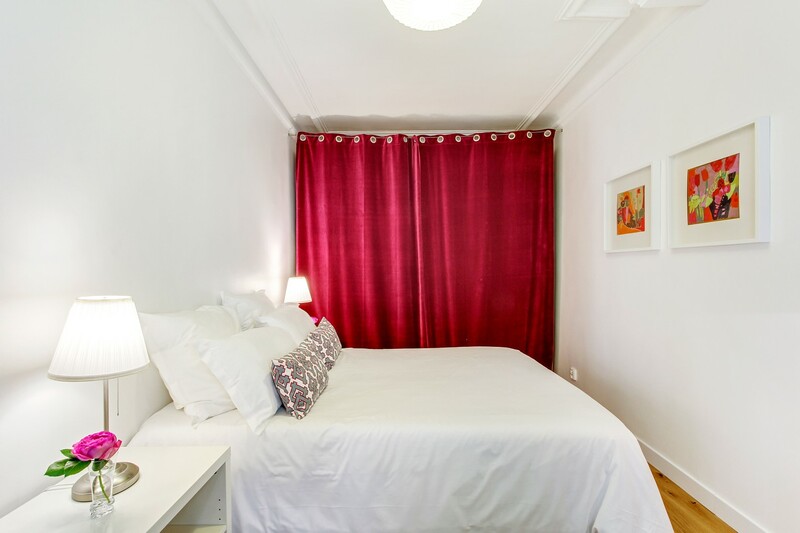 Mature Aussie lady on 1st European trip"
The Montmartre Vineyards apartment was charming, clean and comfy and a pleasure to come home to a lovely clean comfy bed at the end of a tiring day walking the streets of Paris! I would recommend this apartment to couples and single mature ladies like myself, I felt secure at night and will tell my friends at home. This was the second time I rented this apartment. Everything was perfect. From the woman who greeted me on my arrival. The free bottle of wine. A quick walk to the market area to pick up the best cheeses and ham and we were set to enjoy all that Paris has to offer. The place is well equipped. Has everything we needed. It is a quiet oasis from the bustle of the city. We would go out in the morning and then need a break from the crowds. So we would slip back to our apartment for lunch. Always it would rejuvenate us for an afternoon of exploring. We would definitely come back again. Our stay was terrific! The listing was accurate and the photos reflected well this delightful appartment that was our 'home away from home' while we were in Paris. The property was clean and well maintained and there was a wealth of information available about anything we needed during our stay - i.e. local shops, restaurants, amenities etc. My concerns prior to arrival had been dealt with promptly and with care. I would not hesitate to either return to this property ourselves or to recommend it to others. We really enjoyed exploring Montmartre and especially the walking tours. We enjoyed Au Reve for our daily caffeine fix. A highlight during our stay was Caroline Nin's concert which we learned about from the agent who was also very responsive to our needs. Our only regret was to have stayed only one week! I usually stay in a hotel when I come to see my daughter in Paris but I'm so glad I took a chance on staying somewhere less corporate this time. I have two main points to make about this rental. Firstly, the apartment is a delight. 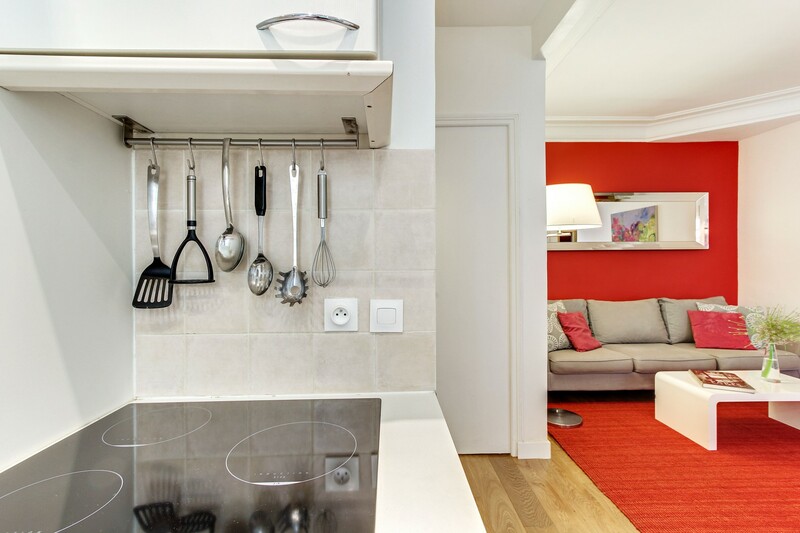 It is a lovely example of a typical Parisian apartment, very well designed and laid out, and it feels like staying in a friend's place, with everything there to hand. It was a lovely space to relax in. The location is also good, with amenities nearby and enough steps to help you walk off anything you might be eating or drinking. Secondly, and just as importantly, the people from the agency were fantastic. Galenya, who checked us in, was very friendly and helpful. However, it was Shelley who responded to my panicked phone call when I realised I'd left a purse in the flat after we'd vacated it, and who actually brought it to the Gare du Nord to restore it to me - completely above and beyond the call of duty. I don't know how this company goes about recruiting coworkers, but the two we met were outstanding. Many, many thanks and I hope we meet again before too long. 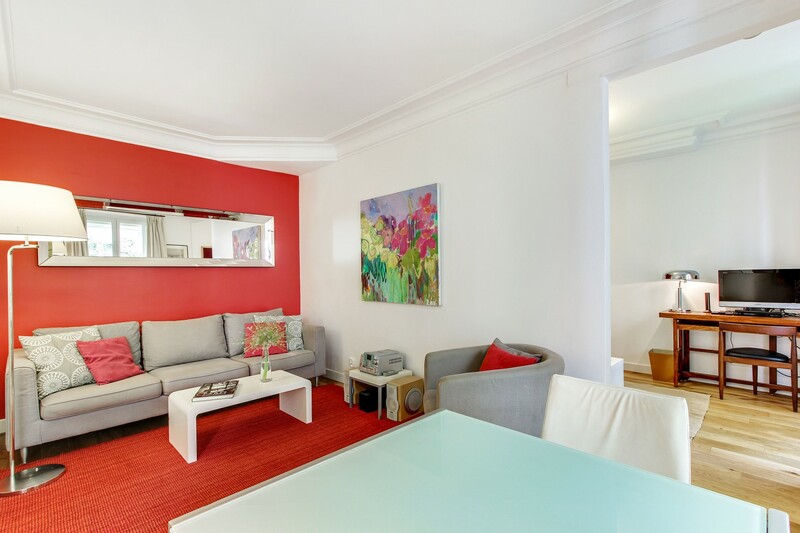 "Great quiet location in Montmartre"
Our family really enjoyed our stay in this quaint little Parisian apartment. The area was quiet yet had a homely community feel. The location was great and it was a 5 minute uphill stroll to the sacre couer. There is a local convenience store and a bakery close by and plenty of good restaurants nearby. We were met by the representative who was very informative and friendly. I was also pleased with the booking process and the promptness of refund for the deposit.I Will most definitely recommend and use the site again. "we've returned to our other home..."
An absolutely wonderful apartment. 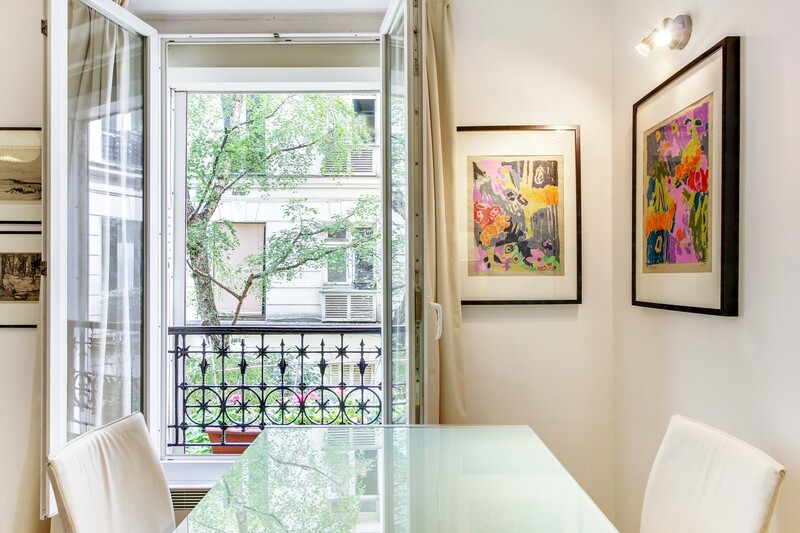 Super clean, Perfect location, quiet, cool in the summer because it's in the back of the building, overlooking a peaceful small shaded courtyard. it was our second time there, felt like coming home. Great staff answered all questions we had and made a few good suggestions for dinner. 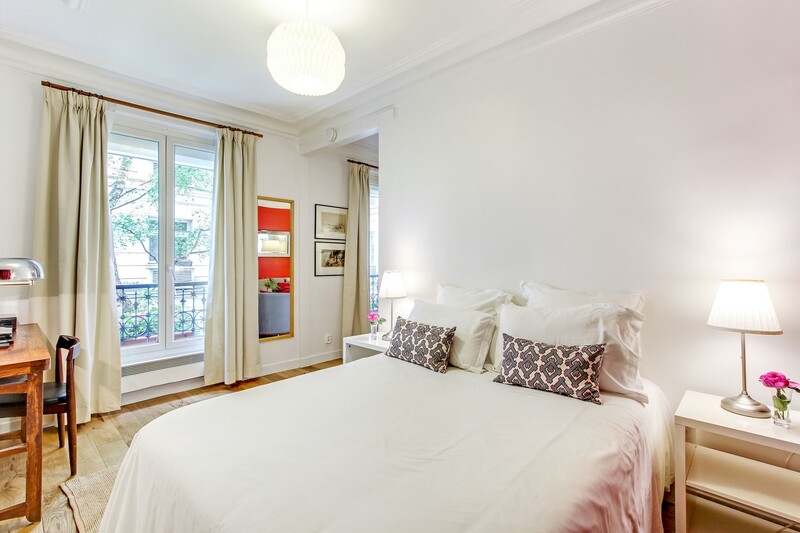 We have recommended Paris Rental Connections to a few friends over the last year and all have raved about their places. We will use them again on our next trip to our favorite city. "Great apartment in a Great Neighborhood"
This was our second visit to Montmartre Vineyards (we had previously stayed here for 4 weeks in the summer of 2008). We were as happy this time as we were 4 years earlier. The representative met us at the apartment -- timely, friendly and helpful. The apartment is in a great residential neighborhood just a couple of blocks from a good Metro stop. We love shopping for bread, cheese, fruit, etc. at the local merchants. 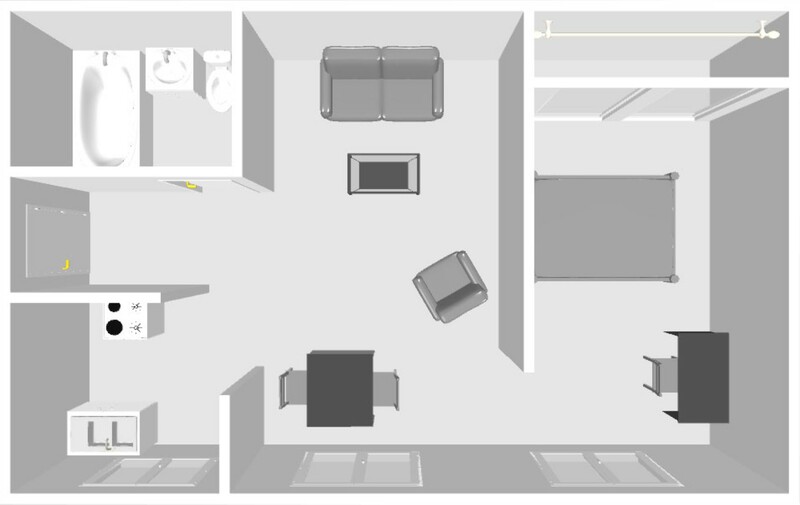 The apartment is a good size for 2 people, with a bedroom and separate living room. Kitchen has all the necessities. We had no complaints and would love to return. "Great,comfortable stay in a beautiful area. Shelley was great explaining everything,with many excellent recomdations. Loved the neighborhood, bar across the street, walks, and everything about Paris. Plan on pass the word, if in Paris, stay here, you will love it. I absolutely loved the apartment. This little apartment had everything I needed to enjoy my eight nights stay. 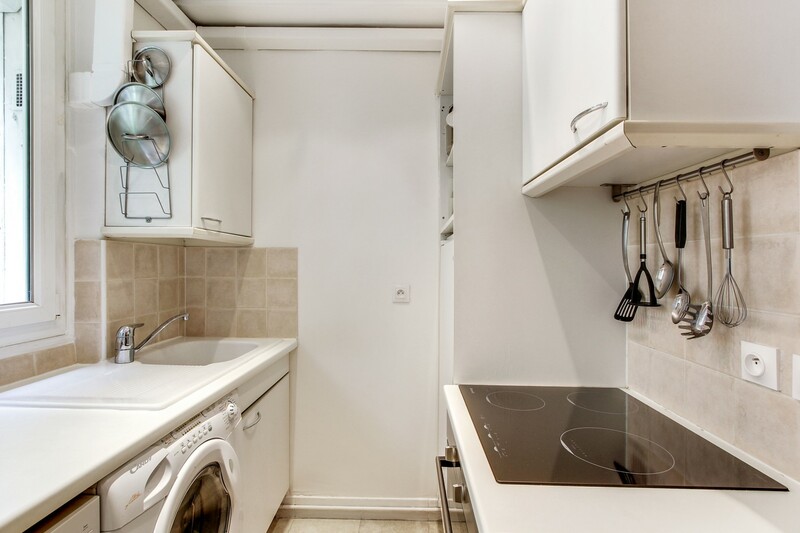 The kitchen is fully equipped (induction stove top, Bosch dishwasher, small washer and drying machine, microwave). The bed was comfortable and my niece told me the couch was great to sleep on. The apartment is in the inside of a courtyard so it is quiet. I also felt quite safe there. In addition to the apartment the location was fantastic. We were steps away from the metro. We could easily reach the tourist areas and then happily come back to the apartment away from the bustle of the tourist district. If that wasn't enough just down the road was a great market area with the butcher, green grocer, cheese, wine and bakery stores. The food was fantastic. Plus the "Cookin with Class" school was close to that area. I would definitely stay in this apartment again. A delightful, comforatable apartment in a fabulous location. Everything has been thought of and the service provided by Paris Rental Caoonections was second to none. I look forward to staying in this apartment again if I am ever so lucky! We enjoyed our stay (mom, dad, 9-year old daughter) at Montmartre Vineyards. The apartment was well equipped, clean, and quiet--excellent for our needs. 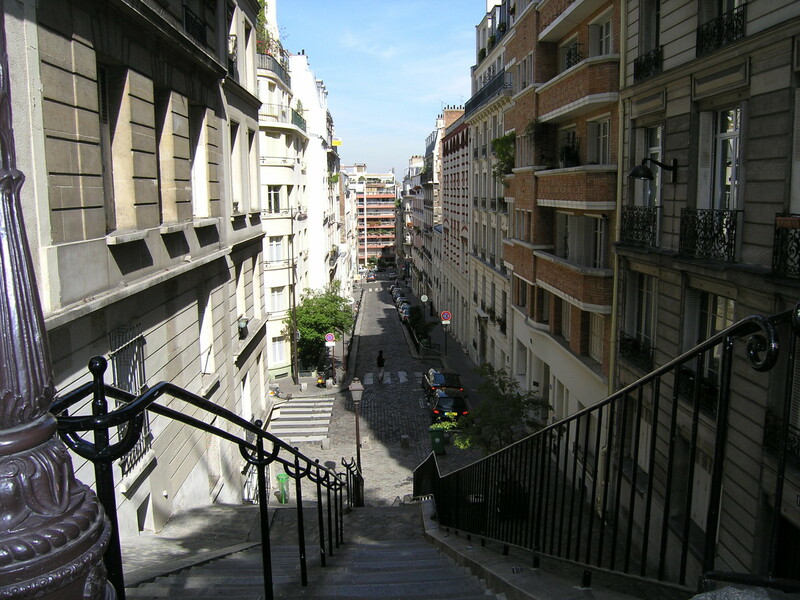 It also was just a short (but uphill) walk from Montmartre. The agent was informative in getting us settled and when we left something behind, helped us recover it. We would rent this apartment again. We loved the location of this appartment - several days we just mooched about in the immediate area with so many cafes, shops, galleries,etc. within easy walking distance (so long as you can do hills, steps and cobbles) So nice to be greeted and inducted by Shelley - made us feel very 'at home' from the beginning. Great to have internet access and laptop. We walked from Gare de Nord (about 20-30 mins)which was quite straighforward. Have already recommended widely to others. 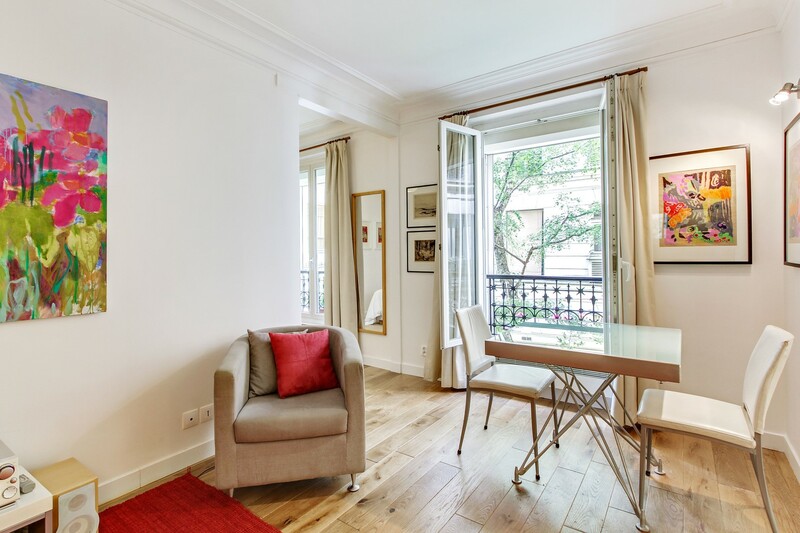 Right in the heart of Montmatre giving a authentic Paris this apartment was even better than we expected. 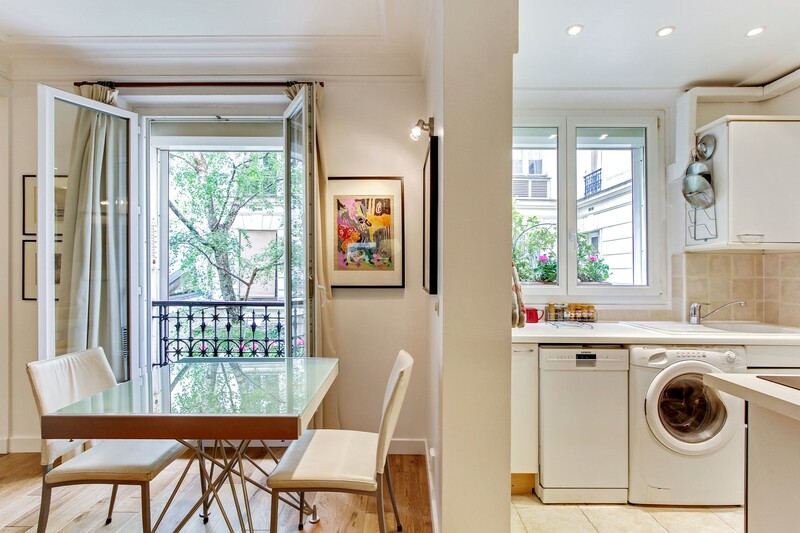 "It felt like being home"
A nice little appartment in the heart of Montmartre. We really enjoyed our stay there. Great complementary internet and phone service. 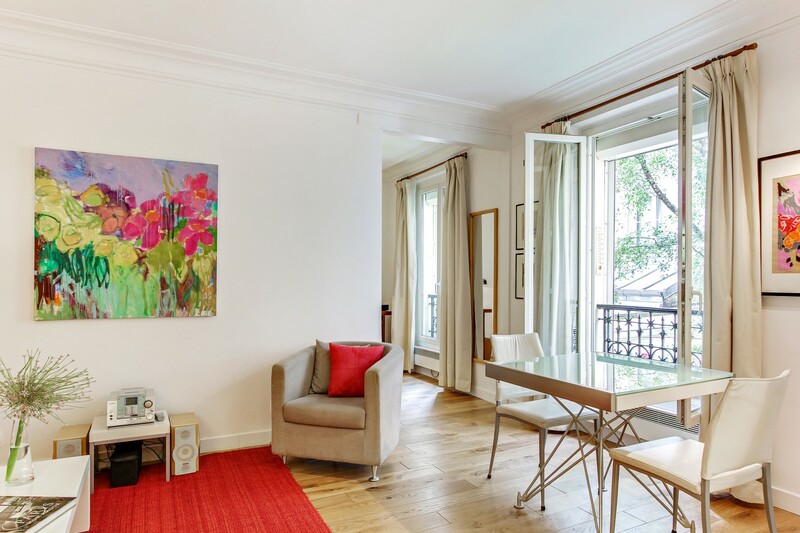 "Awesome place to relax and enjoy the fun of Paris"
We stayed in the Montmarte Vineyards apartment, and absolutely loved it. The location was fantastic, the apartment was wonderful. The apartment contained everything that we needed. We especially loved all the travel books, and maps that were in the apartment- very helpful. 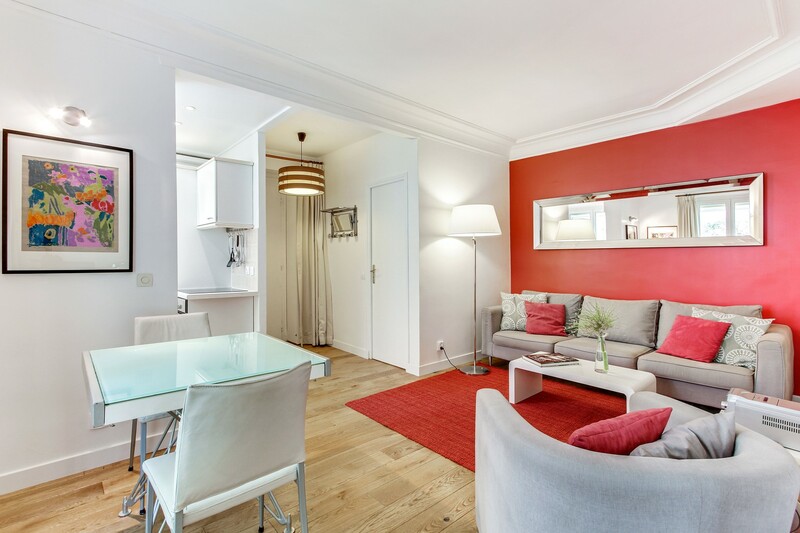 This is a beautiful apartment and ticked every box I had for our stay in Paris. Location is fantastic, we felt safe and comfortable walking the streets close by at night and catching the Metro every day, surrounding neighbourhood has excellent bistro's so you are guaranteed a great meal at a different establishment each night if you choose (we did). The apartment is well equipped with those comforts you'll find in your own home: books, iron & board, washing machine, umbrellas, shopping trolley, Dvds, WiFi. The layout is perfect and they have maximised the living space with light coloured interiors and soft furnishings which give the illusion the space is larger than it is. I loved the tall windows, the view into the courtyard with the big tree and the few plants on the window ledge added privacy and charm. A lovely touch was meeting Shelly on arrival at the apartment to get us settled in. 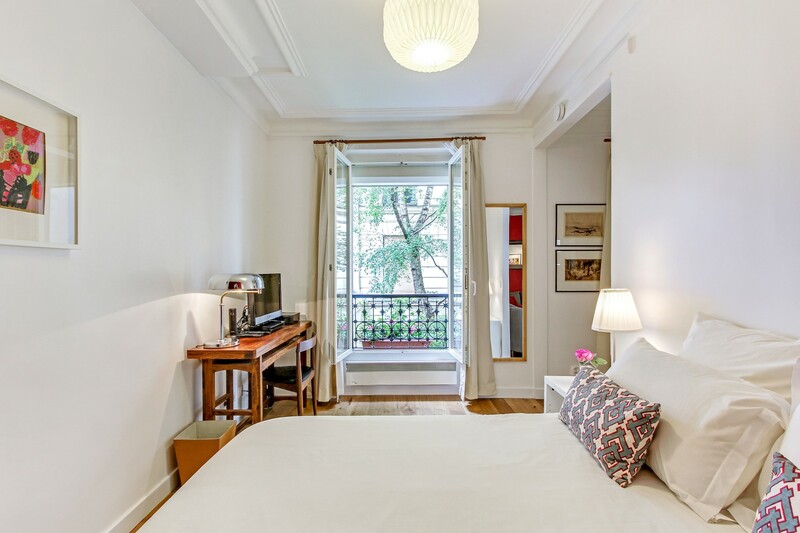 I couldn't recommend this apartment more, my boyfriend and I had a lovely stay in Monmatre and Paris and I can't wait to return. Communication with the company Parisrentalconnection was good, and bond repayment was prompt. 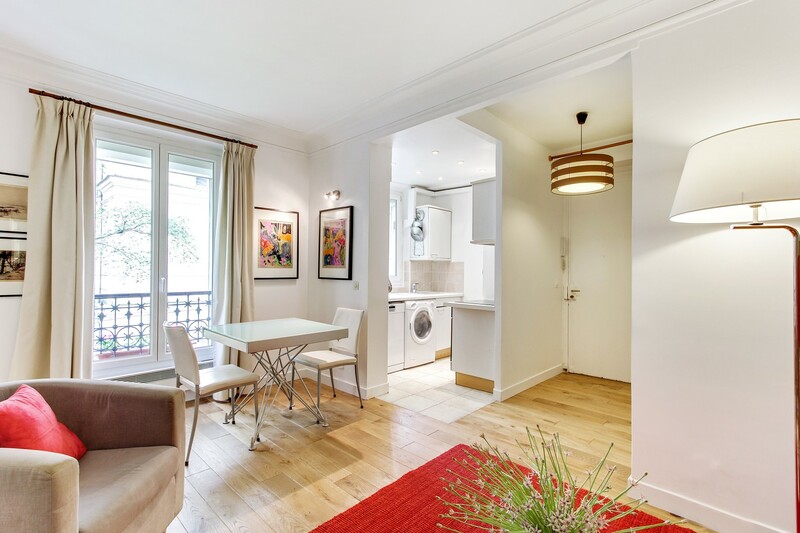 This apartment near the Montmartre vineyards could not be more comfortable and charming. 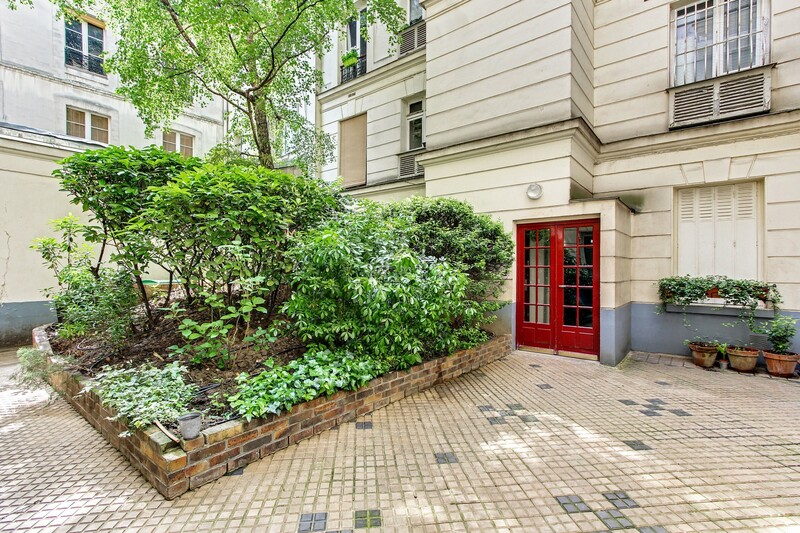 Located on a dead-end part of the street, it looks onto an inner courtyard, so it could not be more quiet and secluded. Yet it comes with all the modern amenities (wifi, TV, Dvds, dishwasher, washing machine, etc. 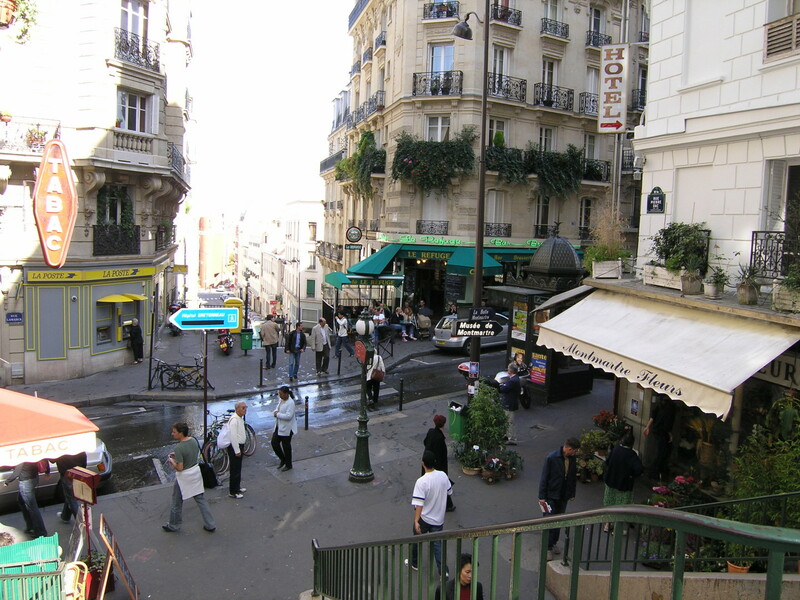 ), and if you climb up the staircase to Rue Lamarck you are in a neighborhood with plenty of restaurants, bakeries, and other shops. 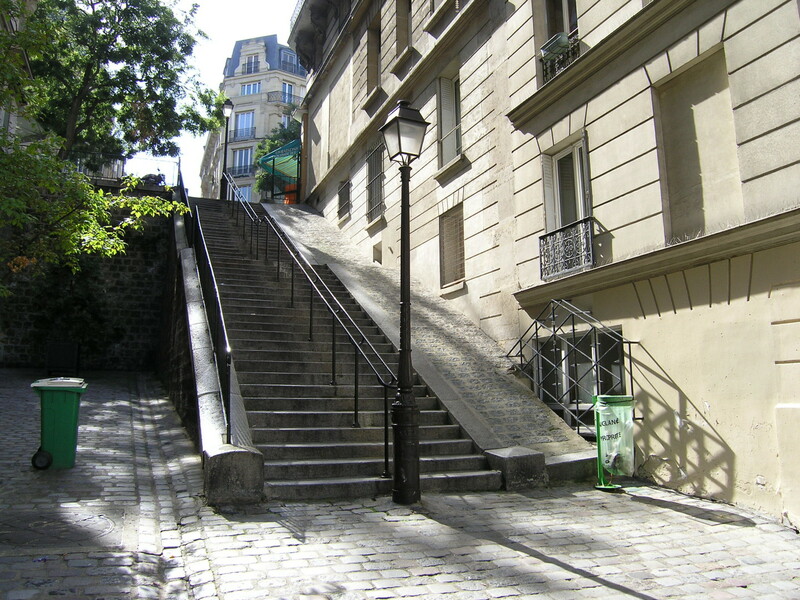 The famous sights of Montmartre are within easy walking distance but because you are on the north side of the hill you are not constantly swimming in crowds of tourists. "A quite and lovely place near Montmartre"
Apart from the problem of getting my car parked, everything else was on line with expectations. Clean, spacious, well decorated (at least to my taste), with everything you need for your stay. Very confortable king size bed, small but well equiped kitchen, and very calm neighboors. Cafe, Bars, grocery shops within walking distance. Was a perfect stay.
" Great experience in Montmartre"
We utilized Michele's referral for Chauffeur service and arrived on time to meet our Host. Apartment was comfortable for two and in a great location, close to Metro and all other necessities. We stayed for eight nights. It was nice to stay away from the hustle and bustle of the touristy areas and be close to so many fab restaurants, bakeries etc. Even though we were less than proficient in the language, all the local businesses (as well as people) were kind and patient. Thank you for a great experience.